The announcement comes in a developer blog posted to the game’s Steam page, which provides some genuinely interesting information about Bannerlords’ multiplayer ‘skirmish’ mode. TaleWorlds recognizes that PvP combat was one of the most compelling elements of Warband, and the studio has apparently been hard at work building a new multiplayer experience into its upcoming title (which still does not have an official release date). According to the devblog, Bannerlord will feature a 6v6 multiplayer skirmish mode, which uses a points system to govern the classes available to you. TaleWorlds says it’s aiming for an asymmetric multiplayer system, where you can spawn in cheaply as a peasant pikeman, or spend more points to drop in as a barded knight. TaleWorlds says its developers considered the idea of multiplayer balance carefully when creating the system, but they eventually decided that the notion of ‘fairness’ between classes doesn’t really fit well with the medieval realism thing they’re going for. 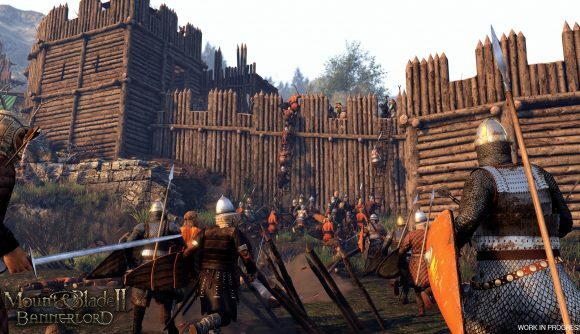 Instead, Bannerlord will feature limited spawns, using something similar to the ticket system Battlefield players will immediately recognize. You can spend a small number of points to respawn as a peasant with a pitchfork, or a large number of points to return to battle as a lance-wielding knight. All of this is promising news from a game that’s felt for quite some time like it might just never actually become a real thing. The big news, of course, is that a closed beta will be taking place. But true to form, TaleWorlds hasn’t seen fit to tell us when to expect that to happen.